It is replaced by the Symbol AP650. 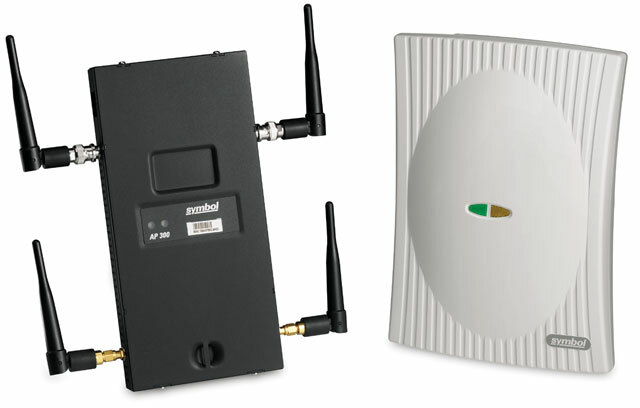 The Symbol AP 300 provides simultaneous wireless service to 802.11a, 802.11b and 802.11g mobile devices with high-bandwidth wireless connectivity at speeds of up to 54 Mbps in both the 2.4 GHz and 5.2 GHz ISM bands. The AP 300 requires no configuration or manual firmware maintenance. The Symbol Wireless Switch discovers Access Ports on the network and automatically downloads all configuration parameters and firmware. Installation, maintenance and troubleshooting costs are greatly reduced. Access Port (802.11a+bg Access Port with internal antennas). Access Port (Single Radio, 802.11g with Internal Antenna). Access Port (802.11a+b/g Access Port with with external antenna connection - antennas not included), black brushed steel housing. Access Port (802.11a+bg Access Port with external antenna connection - antennas not included). Access Port (Single Radio, 802.11b/g only with internal antennas, beige hard plastic housing. Access Port (Single Radio, 802.11b/g only with external antenna connection - antennas not included, black hard plastic housing. Wireless Switch Kit: Includes WS2000, 2x AP300 (internal antenna) 802.11 B/G, power supply and line cord. Bundle: Qty 1 WS2000 and Qty 2 802.11b/g Access Ports (AP300 / Internal Antenna, includes power supply and US line cord). This item cannot be ordered in the US or Canada. Please Call for more details. Bundle: WS-2000 and AP300 including 802.11a/b/g Switch, b-g Access Ports with Internal Antennas, US Line Cord and Ethernet Patch Cable. Bundle: Qty 1 WS2000 and Qty 2 802.11a/b/g Access Ports (AP300 / Internal Antenna, includes power supply and US line cord). This item cannot be ordered in the US or Canada. Please Call for more details.